Most kids like models and miniatures. Some of us never outgrow it. And maybe it ran in the family. My brother, Curt, was ten years my senior. He built championship flying model airplanes and display-quality solid models. When he was in the service during WWII, he sent me solid model kits as gifts. I happily built them but mine never came out looking like his. I kept trying though. I liked making things. When I saw a movie short feature about putting boats into bottles, I had to try that. I did several crude vessels made of cardboard, paper, toothpicks and such and managed to get them to sit up in their bottles. Then I made some unbottled model ships of similar material. It only took a little guesswork to figure out that they were meant to be ships. When I got older and could afford them, I bought some kits and build far better ships. But they were still pretty crude compared to my brother's craftsmanship. Over the years, I assembled and painted a lot of plastic model planes and, when I became a motor racing fan, I did some plastic model race cars. The plastic kits always came out looking far better than my wooden models. It was some time after I'd moved to New York that I discovered soapstone. It's wonderful stuff, real rock so soft you can carve it with a knife. I found it easier and more satisfying to work than wood. If I'd had the money and space, I'd have been a collector of antiques and archaeological artifacts. As was, I had neither. But soapstone was cheap so I started making my own artifacts, inspired by, but not copying, the real thing, in sizes that fit on my mantelpiece. Then I met Noel and Lin Carter. I'd been acquainted with Lin for years but had never really gotten to know him and his wife, Noel, until we were both selling to Ace books. Our editor, Don Wollheim, invited us all to a party at his home on Long Island. Lin and Noel and I spent much of the party gabbing together. When it broke up, the hour was late and it was a long subway ride back to Manhattan. Lin and Noel invited me to spend the night at their place. The Carters had a marvelous old house in Hollis, Long Island. It was practically a museum in itself. There were four stories stuffed with fascinating artifacts, antiques, scientific and science-fictional stuff, interesting odds and ends, and assorted dogs ranging from an elderly Chihuahua to a half-St Bernard. Noel was accumulating miniatures for a 1:12 scale doll house she planned to build. The fictional resident of the house would be a Victorian gentleman who dabbled in the arts and sciences, including archaeology. I decided to make Noel some miniature artifacts. I started working to that specific scale, and copying artifacts from photographs. I made some camping equipment, too, for the gentleman's field trips. I made anything else appropriate that I fancied doing. Altogether I did almost a hundred pieces for Noel. It wasn't til I moved to Florida that I got serious about the possibility of doing a doll house of my own. 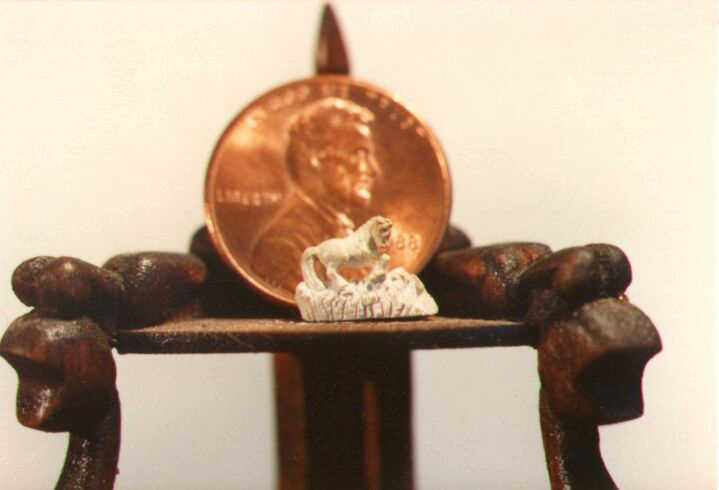 Miniature-making was a great hobby for someone who likes to dabble in various crafts. 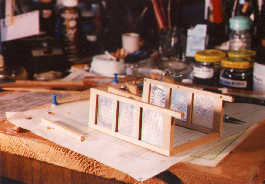 It's a lot cheaper and easier to make a 1:12 scale pie chest on the kitchen table than to take up full-scale carpentry, acquire the tools, do all that work and then find a place in the house for the finished product. Doll house miniatures became a nation-wide fad. Lots of materials and small inexpensive tools became easily available. I'd long had a Dremel hand tool. I acquired a Sears scroll saw, a Dremel mini wood lathe and a thing Dremel called a "drill press stand" for the hand tool. I got more small hand tools and extra X-acto knives. I stocked a little lumberyard of basswood, and got samples of fine hardwoods that were plenty big enough for the scale I worked on. I got carried away. I made some things with found materials, modified some from kits, and made some from scratch. I upholstered some little chairs with material from cast-off neckties. I did some small needlepoint rugs. I crocheted a tablecloth from sewing thread. I made a lot of things from beads and made miniature beads from bits of copper wire. I tried wood staining, wood carving, fine furniture finishing, and wiring mini lamps. 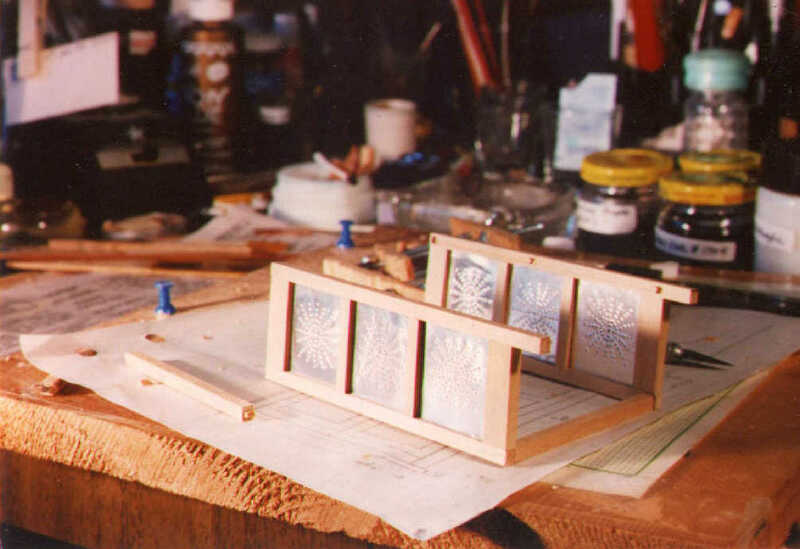 I watched The Woodwright's Shop on PBS and learned a bit about working with metal. It inspired me to make a few simple cutting tools for myself. A good chisel for tiny dove-tailing could be fashioned from a bobby pin leg held in an X-acto handle. Pieces of old saw blades could be shaped into suitable-size scrapers and into parts for minis. 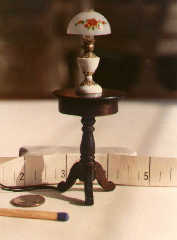 The old-timey tools Roy Underhill used on the program inspired me to make miniatures of some of them. I got into authentic woods, such as beech, maple and rosewood. I made blades for the mini saws from pieces of saw blades, so they actually cut. I used a nut and bolt to make the vise on the mini workbench functional. With a piece of a broken drill for the bit, my carpenter's brace will cut a small hole. Needing a place for all these, I made a room box that represents a workshop in a shed. I never did get around to building a doll house to put the rest of my minis in. Making more minis of items that caught my fancy was too much fun.